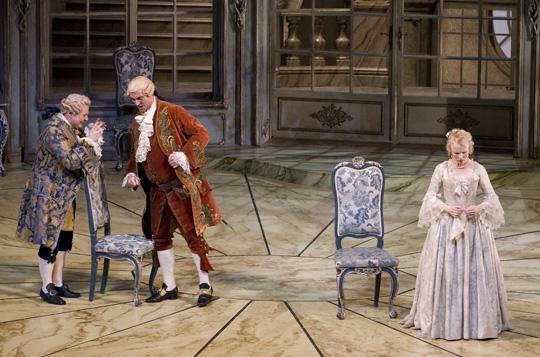 Some forty years after its creation for the Bavarian State Opera, Otto Schenk's production of Der Rosenkavalier has found its way to Geneva Opera, where it will play in repertoire until 12 April. If there is relatively little new to say about a vintage production that has been seen by many thousands of people in Munich and in other houses elsewhere, and by many tens of thousands more in a DVD set filmed in 1979 with Gwyneth Jones, Brigitte Fassbaender and Lucia Popp under the inspired baton of Carlos Kleiber, it is nonetheless welcome to catch it again, with an entirely new cast and in a new and more intimate setting, a reading of Strauss and von Hofmannsthal's 1911 opera that is fleet of foot, assured, full of Personenregie touches that hit the mark, and thoroughly professional in all the passages that matter. Schenk knew the pitfalls to be avoided in this 'comedy for music' and found ways to avoid them: to take but one example, the loutish behaviour of Ochs's retinue in Act Two, which is often disruptive and embarrassing onstage, is merely suggested by some antics in the galleried rear section of the stage, behind the glass walls that separate Faninal's grand drawing room from the rest of the Palais that he has had constructed. Beautifully discreet and yet highly suggestive. However, if there is one scene that is perhaps below the rest of the production in terms of stagecraft and dramatic inspiration, it is the first scene of Act Three, which nowadays looks tired and unimpressive, with rather feeble 'scary' effects - although Schenk empties the stage of onstage crowd for the subsequent dialectic between Ochs and the Marschallin, before bringing them all back again for the general exit of the Lerchenau retinue, and this works brilliantly in terms of varying the dynamic of perhaps the most tiresome passage in the entire opera. So, a pleasure to experience once again a vintage production that gets everything right for ninety per cent of the time, and that does justice to all the fundamental values of this inexhaustible work. The Geneva casting looked inviting, with Soile Isokoski and Alice Coote as Marschallin and Octavian respectively, Alfred Reiter as Ochs and Kerstin Avemo as Sophie, under the experienced (if not that well-known) baton of Niksa Bareza. To start with the latter: he presided over a leisurely account of the score, making absolutely certain that stage and pit remained together, at the expense of the spontaneity and passion that so infused every performance of Rosenkavalier by Kleiber. The playing by L'Orchestre de la Suisse Romande was idiomatic, with warmth throughout and a welcome sheen to the strings that emerged as the evening progressed. Bareza was at his best in the chamber music passages that feature surprisingly often in this opulent score, and he was very singer friendly, reducing the orchestral dynamic whenever there was a danger of a soloist being overwhelmed by the sheer volume of Straussian sound that can so easily be generated. The obverse side of his reading was its lapse into occasional passages of pedestrian playing - the taking of the odd risk here or there might have lifted the level of overall performance by several notches. But he knows and feels the Austro-German tenor of the piece and we were in safe hands throughout. 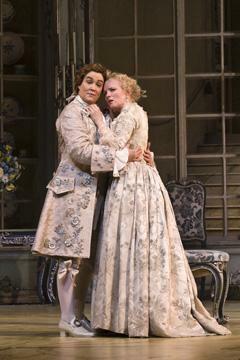 Three of the four principals gave us Rosenkavalier moments to remember, however. To start with the youngest and least experienced, Kerstin Avemo as Sophie has huge promise in the role, and improved steadily as the evening progressed. She started uncertainly in the Presentation of the Rose scene at the start of Act Two, failing to float her high tessitura in that apparently effortless way that characterises great interpreters of the role. I wondered how she was going to fare. But as the evening progressed, her voice warmed up, her demeanour became both more relaxed and more expressive, and by the start of the Trio she was in inspired form, riding over the combined forces of Isokoski and Coote (no mean feat that) and producing glorious soprano sound, honeyed, rich and absolutely bang in the middle of the note. 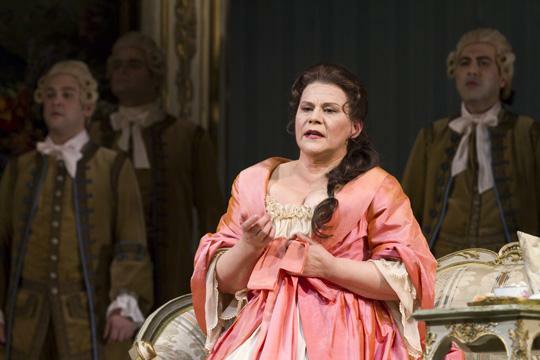 I liked also the start of her final duet with Octavian - Avemo dared to sing really softly and beautifully, shaping her phrases more intelligently than many a Sophie I have heard. For her debut role in Geneva, Avemo impressed. No such doubts about the opening phrases sung by Alice Coote as Octavian, who was in glorious voice from the outset. Coote is by now a practised and experienced Octavian, and knows how to 'nail' the role: her 'girl playing man playing girl' routine was often genuinely funny, with mannish gestures and gait that illuminated what is going on here, while her rich mezzo (and some wonderfully incisive timbre in her lower register) gave constant musical pleasure. Coote's voice lightens considerably as her pitch rises, and she had her soprano moments, but her reading of the part was rock solid throughout, and her outstanding musical line was particularly evident in the ensemble passages. Having seen Sarah Connolly's Octavian at ENO only a few weeks ago, I found a comparison between the two singers particularly instructive. Connolly is rich and opulent, almost plummy at times, while Coote is more varied, more dramatically incisive and more prone to light and shade, which is perhaps appropriate for the callow and fickle youth who abandons the Marschallin and who falls for the first pretty young blonde who comes his way. This was a sophisticated musical performance. I liked particularly her confusion (and lapse into mezzo voce) at the end of Act One, when the Marschallin dismisses her - truly the end of the affair - and I have only one criticism of her vocal technique: a tendency to start a note or phrase at one dynamic level and to augment it before it ends. Coote has no need to do this, because her vocal power and expertise is evident almost as soon as she begins to sing. I was impressed and delighted by her overall performance in equal measure. That leads me to the vocal disappointment of the evening - the Baron Ochs of Alfred Reiter. He knows the role backwards and he sang his way through it, but his vocal Heft was entirely lacking, leaving me with the impression that he was marking rather than really singing the part (although an occasional suppressed cough suggested that he may have been indisposed). Reiter can hit his low C and there were moments here and there when I had glimpses of what might have been, but he relied too much on a sympathetic stage presence (his ovation at the end suggested that this might have worked in his favour) and when Ochs is outsung both by Faninal - an excellent incarnation of the role by Lionel Lhote - and by the Commissioner of Police (Mikhail Milanov), then something is slightly adrift. I got the impression that Bareza and the orchestra were nursing the principal male protagonist, and this slightly upset the balance of the piece. Ochs after all is the driving force, the man whose machinations propel Octavian into Sophie's arms. The three female leads need a strong, Falstaffian Baron Ochs - and Reiter was anything but this. His outburst "Als Morgengabe" would never have interrupted the virile Italian tenor of Gaston Rivero in real life, and his eventual discomfiture in Act Three was a bit of a damp squib. For a singer of his distinction, a lukewarm assumption of the role. And so to the Marschallin of Soile Isokoski. She is truly lovely in this part, and genuinely affecting at the key moments in Acts One and Three when Strauss and Hofmannsthal surpass themselves in inspiration and empathy for the human condition that is constantly explored in this most sentimental of operas. If I have a reservation about Isokoski in the role, it is that she has a slight tendency to coast at times: in the Trio, she was utterly glorious, as opulent in tone and phrasing as I have heard her onstage over many years, but there were passages and moments when I felt that she was not doing enough to keep the listener's interest. This is however a 'counsel of perfection' criticism: the conclusion of Act One, the impassioned duet with Octavian and the reflective passage that follows was simply beautiful. And her final exit in Act Three was done with exquisite sensitivity: the pause, to allow Octavian to squeeze her hand in farewell, the movement of the body, the lilt of "Ja ja," - a wonderfully expressive performance. This was Straussian singing of a high order - and I am delighted to have heard it. The smaller roles were well taken, the chorus well drilled and responsive. 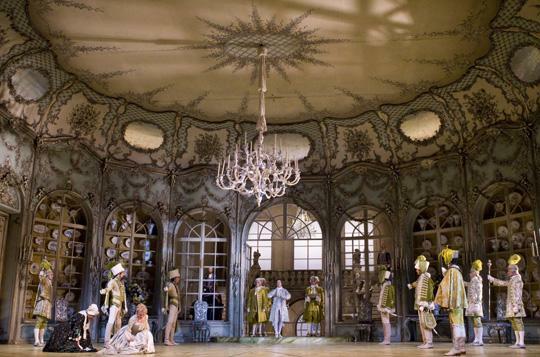 If the sight of the Act Two set no longer raises a spontaneous round of applause, it is not because it looks any less gorgeous than it did on its opening night in 1972, before many of the Geneva cast were born. The look of both set and costumes is in fact a constant pleasure and - Act Three excepted - they have worn exceptionally well. In short, a revival of distinction and quality, which was a pleasure to see once again.